When I get home from hosting a Be Present Retreat and look through my photos, I am always struck by how few I take. Every. Single. Time. I know this is partly because being behind the camera is not really part of my role during these retreats, but somehow, it seems to be a piece in the list of reasons why I have a hard time writing about the retreats when I get back from them. Maybe you haven't noticed, but I seldom write about them when I return. The re-entry time is intense, real life just starts rolling again, planning for the next retreat begins, and somehow I never find my way back to this space to say much. I would like to change that and have been thinking about a few ways to give myself some space before and after each retreat to write about my intentions and experience and then share some of those thoughts here. Sometimes, I become so focused on creating a sacred experience for others that I forget about paying attention to the ways I can make it even more sacred for me. As for Pen & Paper...well...this is the part where I get hung up on what words to use. It was a beautiful, rich, open-hearted experience. We laughed and danced and wrote and "poemed" and played with paint and danced some more. Stories and meals nurtured each of us. Dreams were spoken aloud and then written down inside our journals. Naps were taken. Blue sky appeared just when we asked it to. And laughter arrived again. I love hosting retreats at Frog Creek Lodge here in my corner of the world. Within minutes of arriving, almost every participant mentions that "this space just has such good energy." There is just something about this cabin in the woods. This time we were able to watch eagle parents swoop about looking for food to take back to the nest in the woods near us. And the rain rain rain came down down down, which gave us the perfect writing weather. And then the clouds left while we painted and then played down by Puget Sound. After everyone left on Sunday, Kelly and I took just a few minutes to sit on the frontporch swing and take in the trees and the moss and the air and the birds singing amidst the raindrops. As we sat there, I was thinking about how each retreat brings a unique cast of characters. Deep friendships are born and nurtured and I am struck again and again by the truth and beauty that entwine to create the one-of-a-kind experience for each of us. After each retreat I say, "Oh I think this one was my favorite." And that is exactly how I feel again. Today, I'm excited to share that registration for the Fall Unearth Retreat has begun! Kelly Barton and I are heading back to Frog Creek Lodge and bringing Mindy Lacefield with us! 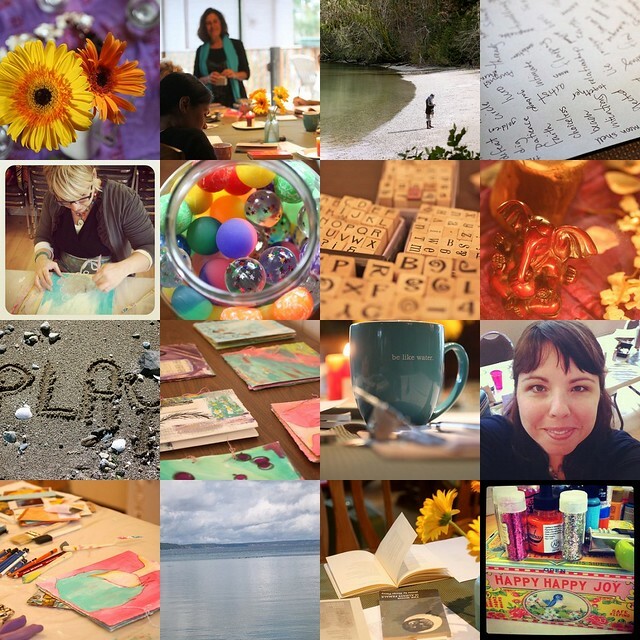 Kelly and Mindy will be co-teaching three days of painting and mixed media, and I will be sharing some of my favorite creative self-care practices (including writing and photography) throughout our time together. The three of us are integrating all of it into one big juicy creative adventure. There are just 12 spots left, so please head over to the Be Present Retreats site to learn more.